Author Gayle Pitman has seen first-hand how far censors will go to have a book pulled from their community after her own book, This Day in June, became a target in Hood County, Texas. Pitman shares her story and a cautionary tale of the effects of censorship for Banned Books Week on the American Library Association’s Intellectual Freedom Blog. In July 2015, Hood County, Texas became a bitter battleground between would-be censors, the LGBTQ community, and free speech advocates after more than 50 residents filled formal challenges against two LGBTQ-themed picture books in their local public library. 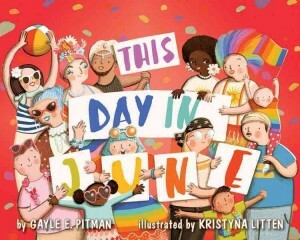 Cheryl Kilodavis’ My Princess Boy and Pitman’s This Day in June were criticized as promoting “perversion” and “the gay lifestyle”, and concerned residents were calling for the books to be removed from the children’s section of the library and shelved with adult titles. [Books] about LGBT people continue to be challenged throughout the United States. Why? Because the most powerful way you can marginalize and disempower a group is to erase them – literally or metaphorically – from existence. That’s what book banning – and censorship in general – is all about. As Pitman also points out, we can stand up to censorship and support the right to read. From encouraging your library to put up a display of banned books, to organizing a reading group to discuss challenged books, to attending meetings in defense of challenged books and more, the efforts of community members are ultimately what keep books on their shelves. To read Pitman’s full piece on the ALA’s Office of Intellectual Freedom blog, click here.